﻿ You`ve only got to look at all the others ! Even crappy Bacofoil aerials come with instructions, in fact, because they`re aimed at DIYers who, the manufacturers assume, don`t know anything about aerials, they`re actually more likely to come with instructions. It`s that very ignorance that said manufacturers rely on to sell products which are, well, made of Bacofoil. Anyway, the fact instructions are supplied means that some of the chaps who`ve put together the aerials below really have no excuse whatsoever, although they don`t actually have any excuse whatsoever anyway, because, well you can guess it from the title of this page. But all this observing, it takes sooo much effort. There are bonus marks if the install as a whole is a disaster area, but that`s not really the point of this page, see Cowboys` Locker for that. All pictures are of genuine installs, we have zero tolerance for fake photos ! An absolute gem to start us off, I`ve only ever seen one of these, ever. I assume the chap`s used bits off an old aerial to repair a new aerial. Not all aerial bits are the same. Oh dear, what have we here ? However, the fact the dipole is the same polarity as the reflector should knock quite a bit off the signal. * Thousandth of an inch (for those who don`t know). BUT, unfolded directors plus a Speedbird reflector, well that`s a rarity indeed. This installation gets bonus IQ stars for the mast. What the hell is that ? which aren`t even the right ones for the job, they`re just aerial clamps ! ? ! Who would want that on the front of their house ? That`s the question. This install is another perfect example of Bodgers being bleedin` lucky, because I reckon there`s a good chance this Bacofoil aerial is probably working OK. The site (Staveley) is actually in a reasonable signal area and “Speedbird “ reflectors don`t actually knock that much off the signal. Bodgers luck also extends to the fact that an aerial with unfolded directors will also work, to a certain extent anyway. When I tested one it lost between 1dB and 5dB (the loss varied with the frequency). 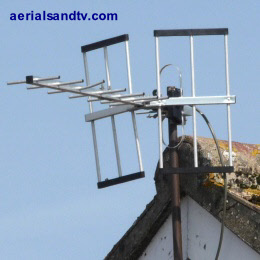 One last thought, if this aerial was horizontally polarised (as most are) it`d look just like an aeroplane, in fact if the wind were in the right direction it may even fly. Fly away from this disaster area, no longer will people laugh at you. You`re not a duckling, you`re a swan *. Yes, I can present our first double 5 star install ! ! 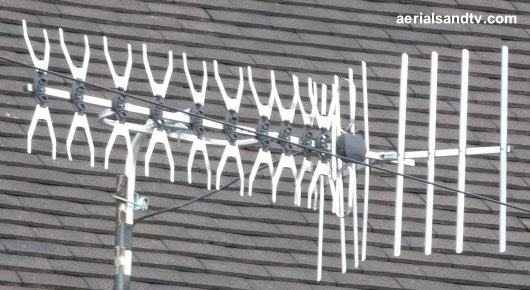 How many mistakes can you spot in this aerial installation ? Without even counting the fact he`s used a Bendy Bacofoil aerial (aka an Argos/Screwfix special) I`ve found seven, but there`s every chance more are there, somewhere……. Also note just how bendy the dipole is on this Bacofoil aerial. The cable is sloping down into the dipole box, thus assisting water to gain its unwelcome entry. Always remember water flows downhill....... Thus whenever a cable enters anything you don`t want water to get into make sure the cable is approaching it in an upwards direction. Actually there`s another reason why the aerial should be kept away from the chimney, any fumes coming up the latter may negatively affect the alloy which the antenna is made of. The loft kit`s pole is mounted through the elements of the aerial. Since the pole is the opposite polarity to the aerial it probably wouldn`t make much difference, but it`s still an error, and we`re not in a forgiving mood. The screws are in the mortar, they should be in the bricks. (yes you`ve got it) a chimney bracket ! In my experience Bodgers are flukey gits, thus, despite this being an absolute disaster of an installation, it really wouldn`t surprise me if he gets a perfect picture, and it lasts for 30 years. I`ll bet you`ve never seen this before have you ? 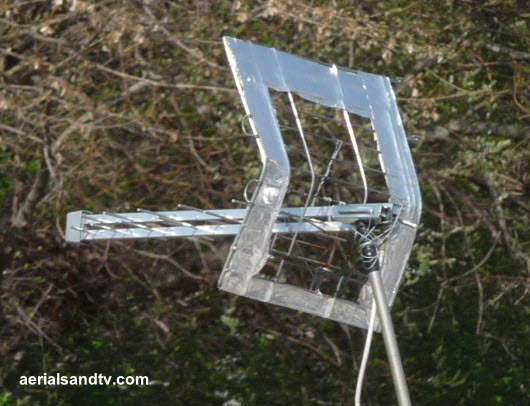 A Log Periodic aerial with a reflector ! The ultimate proof that a little knowledge is indeed a dangerous thing. This was spotted on a canal boat at Tinsley Marina, he`s chosen the right aerial type - a Log - for a boat though I find those alloy rods sometimes break when you bend them straight, that`s why we only recommend the DM Log for touring. BUT, one of the reasons a Log is well suited to boats or caravans is because it`s flat due to not needing a reflector, so fitting one negates one of its major plus points ! That Bacofoil all round the edge of the "reflector" does make it stand out for the photograph, so I`m sure I speak for all of us when I record our thanks to him for adding it. Finally, and most importantly, how lonely is his grill pan going to be now its all on its ownsome ? 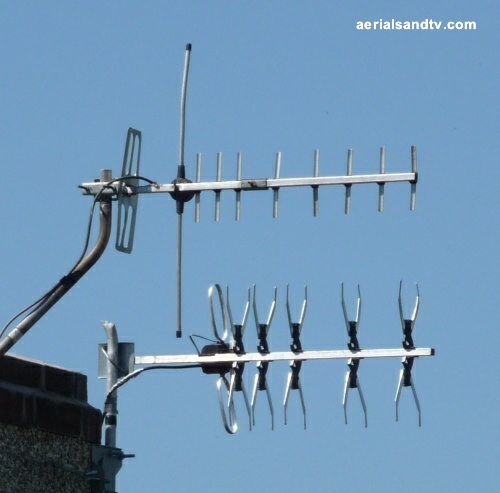 Incorrectly polarised aerials are actually fairly common, and, in fact, if the signal strength is high enough, they may still work fine. How dim would you have to be, if you`ve already got two (correctly) polarised aerials on your pole, to incorrectly polarise the third one ? So, he wouldn`t have had to look at any of the others around him, just the two aerials that he`s actually having to work around to get the third one onto the mast….. 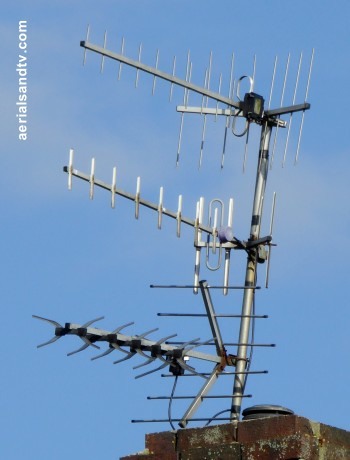 I considered giving our mate a bonus Idiocy Quotient mark for fitting a third aerial when you don`t even need to, but I remembered he`d already got 5/5 anyway, so at least he`s saved that indignity. I`ve entitled this picture “getting a dab on”, that being a pun, at least “up North”. In these parts “getting a dab on” means working up a sweat. Although in the case of our misguided DIYer he`d have got more TV signal out of this if he had have worked up a (bit more of a) sweat by cutting the dipole down, remember wavelength is inversely proportional to frequency (TV is a higher frequency than DAB therefore the wavelength is shorter, therefore the dipole would be shorter). 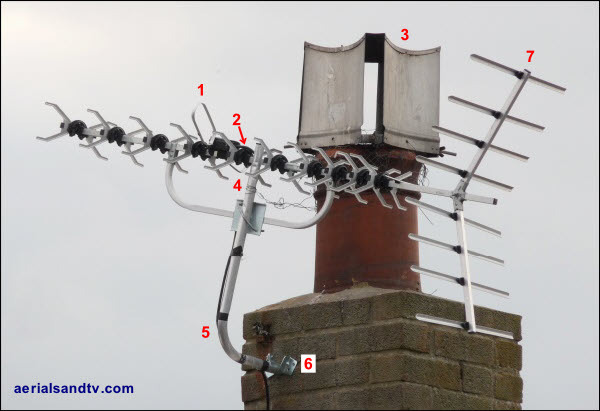 As it is he`s got a full length DAB half wave open dipole fitted in a TV aerial ? ! ? Why ? That`s the question. 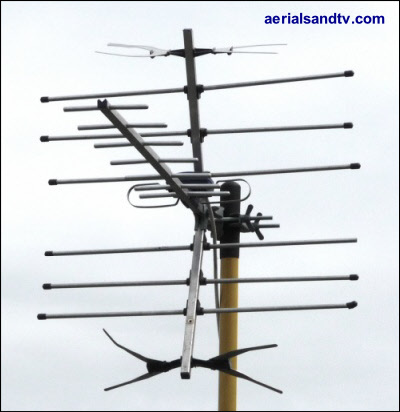 In fact another quite pertinent question is : is it a TV aerial or a DAB aerial ? I suspect he`d get the same DAB signal out of it regardless of the TV (UHF) directors and reflector, but I wouldn`t have thought he`d get that much TV (UHF). Having said that, I happen to know he`s not that far from Lancaster transmitter so, most annoyingly, it may well work fine for both DAB and TV……. Yet another case of bodger`s luck. 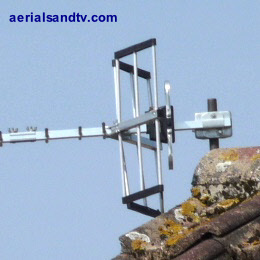 Of course if he`s in an area of signal so strong he gets TV out of (effectively) a DAB aerial, he certainly doesn`t need two aerials on his house does he ? ! ? Bonus marks for the fact that DAB/TV aerial was originally a Contract type, and, in fact, an extra crap Contract type in that it`s only a 10 element yet still employs a boom coupler. In addition the aerial in the background is a Bacofoil (notice the fact the reflector has already fallen off and the dipole is bent to buggary), oh yes, and he`s bodged the cable join. No self amalgamating tape for our mate….. Lastly, he certainly likes 1 inch diameter poles doesn`t he ? Careful examination of the picture will reveal where the pole has already failed and he`s just moved the Bacofoil aerial down a bit !